I am bad with numbers. Really, my SAT Math scores were dismal. For example, my math skills are so bad that when a cake recipe calls for 8 inch or 10 inch pans (and I only have 9 inch pans) I will either decide not to make the recipe or forget about pan size altogether and make cupcakes. My brain does not calculate volume. That’s how The Mistah and I started out with a recipe for Chocolate Mayonnaise Cake but ended up with cupcakes instead. The Mistah’s coworker, the same one who threatened to stalk me for a beet recipe, brought this chocolate cake into their office. The Mistah forwarded me a crappy Blackberry photo of the cake. And I promptly demanded that he get the recipe. There was a little note on the recipe that said, “I didn’t have three 8-inch pans, so I engaged in some serious higher math and figured out that the volume of the three 8-inch pans was roughly the same as two 10-inch pans.” Right. Did I happen to mention that The Mistah works with really smart people? Given a slide rule, a voodoo chant, or some fairy dust, I could have taken my chances and made the cake in my two 9-inch pans. But I decided to make cupcakes instead. And since I didn’t know how many cupcakes would result from a recipe that makes three 8-inch or two 10-inch layers, I had to engage in some equally frustrating math to scale the recipe down by half. Seriously, if you could see the handwritten calculations on my recipe, you would be either amused or concerned. Or maybe a little of both. I know I am. But despite all those obstacles, and the discovery after the fact that we forgot to add the brown sugar (oh, did I mention that The Mistah made this recipe with me as his sous chef? ), the cupcakes were a success. The tops domed nicely and got cracked and craggy. And the cake was moist with a mild chocolate flavor. 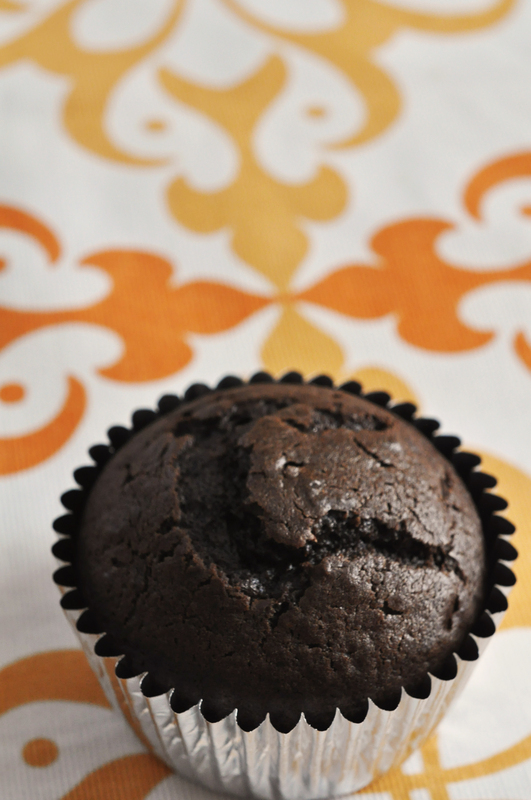 Eat them naked or topped with a simple chocolate buttercream frosting…the cupcakes, not you. BAH Note: In addition to being a serious math slacker, I’m also a notorious rule breaker. Bon Appetit’s recipe said not to use more than a 61% cacao chocolate. I had, and used, 70% cacao bittersweet chocolate and didn’t experience any problems. As I mentioned above, we also forgot to add the brown sugar. While leaving it out didn’t break the recipe, I recommend you use it. Should you want to make the layer cake version of this recipe, check out the original recipe here. Heat the oven to 350 degrees and line a cupcake pan with 12 liners. Combine the bittersweet chocolate and cocoa powder in a medium bowl. Add the boiling water and whisk to combine until the chocolate is melted and the mixture is smooth. Combine the flour, baking soda, and baking powder in a second medium bowl and whisk to combine. In the bowl of a stand mixer fitted with a paddle attachment, beat the mayonnaise with the white and brown sugars until thoroughly combined, approximately 2 to 3 minutes. Add the egg and vanilla and beat until fully incorporated. Add the flour mixture and the chocolate mixture, alternating between the two, beginning and ending with the flour, scraping down the sides of the bowl as necessary. Divide the batter into the cupcake liners and bake for 15 to 20 minutes, or until a tester inserted in the center comes out clean, rotating the pan after 10 minutes. Cool the pan on a rack for ten minutes and then turn the cupcakes out and cool completely. BAH Note: I scaled the original frosting recipe down by 50% but still had enough frosting leftover for another 12 cupcakes. Note to self, either make 24 cupcakes or scale these ratios down 50% again. BA said to use bittersweet chocolate for the frosting but I wanted some contrast between the frosting and the cake so I used semi-sweet. You use what you like. Melt the chocolate in a microwave (50% power in 30 second intervals, stirring it well between intervals) and set aside to cool completely. Beat the butter until smooth and creamy in a medium bowl using an electric hand mixer. Add the powdered sugar in several additions and beat until well blended and smooth, approximately 2 minutes. Add the vanilla and melted chocolate and beat until completely incorporated. Use a spatula to scrape down the sides of the bowl if needed. I’m hopeless at math, too! Glad the beet stalker is good for a yummy recipe! Kitch, it’s a wonder I ever learned to balance my checkbook. Most of the time, my math challenges don’t present a problem in the kitchen. But I draw the line at calculating pan volume. Because that would be one big, ugly fail. Hubster’s grandmother makes a delicious mayonnaise cake too! His tastes always prefer it served with peanut-butter frosting! Ohhh, peanut butter frosting would be great with this. And a big glass of cold milk. Cracked and craggy. Perfect, Wendi. Thanks Tracy. I firmly believe that the best cupcakes are beautifully cracked and craggy. Gives ’em character. I came in for that very reason: to swoon over that lovely, chocolate agro-crag. Ali, I’ve seen your cupcake magic. So many thanks for the kind words. Oh, how I love Mayo. Great post! Happy to find you! Sandy, all that crazy math aside, this is a super easy recipe. Moist cupcakes and light frosting….it’s a winning combination. LOVE the pink apron you’re rocking out in your About photo. Hope you’ll poke around the kitchen here at BAH. I’m a bit of a baking geek, so now I’m wondering if you can use mayo in place of butter in all recipes (because I think that’s what the mayo is doing here?). Would be an interesting experiment. Regardless, these look delicious! I love a good cracked top. Jen, the mayo does provide the fat. I wouldn’t use low fat or non fat mayo though. And because of that, I now have a small jar of regular Hellman’s in the fridge that I need to find ways to use. I don’t know how it would work in other baked goods though. I’d love to see if you try experimenting. I love reading your recipes. But then I get depressed knowing I’ll probably wind up eating cheese sticks for dinner again. But Wendi, if you’re wearing your hot pink sash and Fanalow Club membership pin when eating said cheese sticks (as I suspect you are), then cheese sticks are completely mitigated by your fashion sense. I have a lovely neon pink wig that I could contribute to your official dining ensemble ; ) Such an addition could even render a meal of stone soup a success! Also, I’ve succesfully used low fat mayo in these recipes and it works fine. Really? Low fat worked without messing things up? I would not have imagined. Beth, any chance you would consider doing a “how to” post over at 990 Square that explains ratios and whatnot? Mayo in a dessert recipe?? Where have I been?? I’m so glad the Mistah took a stab at some baking and they look really good. Wendi I don’t know if you have an iphone, but I hear there is a great app called ratio that Michael Ruhlman designed. I don’t have that app, but it might just work for you! Elizabeth, the chocomayo cupcakes are really good. Even without the buttercream frosting. I’m a Palm Pre girl and the app catalog isn’t nearly as sassy as the iPhone’s but I’ll check and see if they have the ratio app. Thanks for mentioning it.